This month, Uno and I are getting ready to do the hardest task we’ve ever attempted – Virginia City 100. 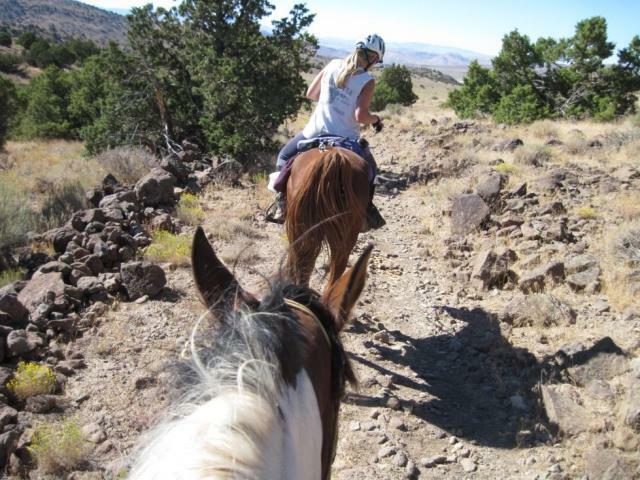 This ride is the Nevada equivalent of Tevis, and having started that ride last year with Roo and gotten pulled at 65 miles, I know how daunting an undertaking we’re facing. As you might remember, Uno is not a lead horse so I’m glad that we’re going to be riding with friends Tami Rougeau and her mare Fancy. I’d like to say that Fancy and Uno are good buddies, but Fancy isn’t that way inclined. She tolerates Uno provided he behaves himself and doesn’t get any grandiose ideas. Uno, being mild mannered (and used to being bullied at home), seems quite happy with this arrangement and quite likes her, regardless. b) where the heck we were supposed to be going. Uno was wearing his Gloves, while Fancy was dressed in a set of four Epics (Tami’s trying to use up her old boot supplies on training rides and saves her spiffier Gloves for competition). 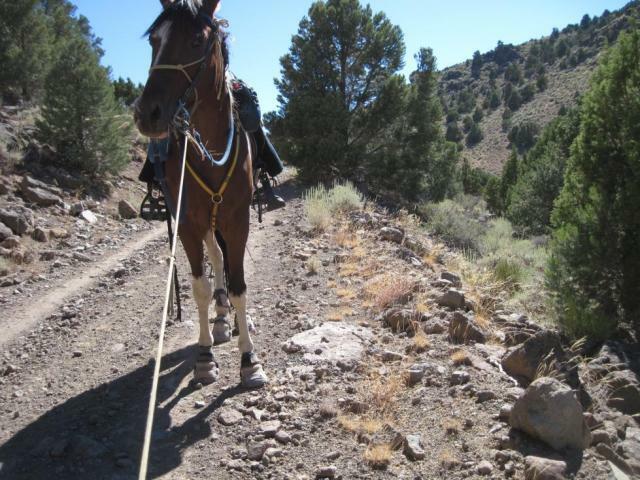 We’d planned a 20 mile expedition: a long trot out along the valley, a short loop around into the Cottonwoods vet check area, and then back along the valley returning to the cemetery at the north end of Virginia City (the location of the ride finish line). Simple. 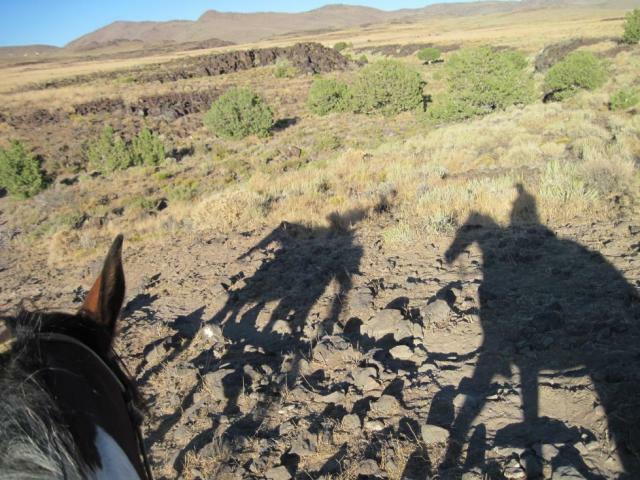 As with all expeditions, good company is essential, and Tami and I chit-chatted our way along the trail, admiring the views and discussing our strategy for the ride, and rode and rode and rode. 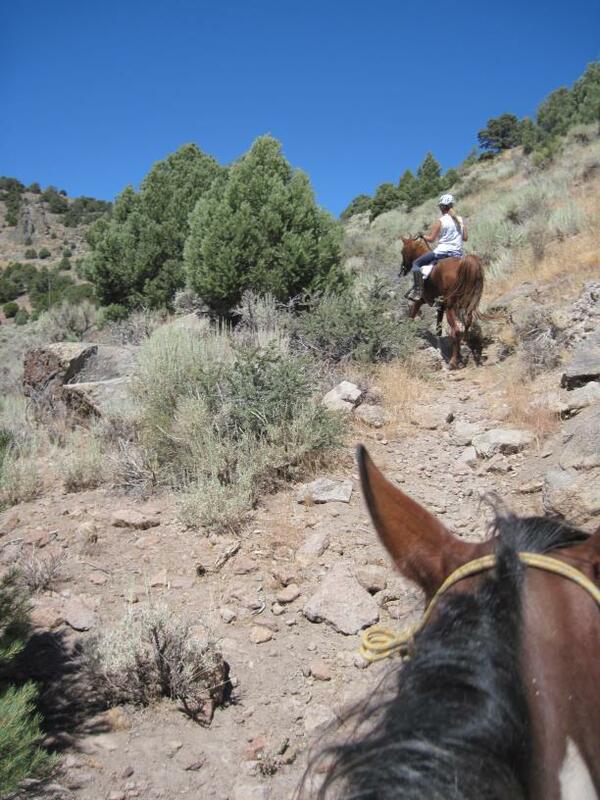 After a decent climb, we hopped off the horses on the downhill to give them a break and I started to wonder exactly where Cottonwoods was in relation to us. I couldn’t quite make the terrain work. I’d only ever been there once before, years ago, in the dark, in a car, crewing for someone during the ride, but this didn’t look quite right. Uno expressed his displeasure by stopping dead at one point, but I assured him that Cottonwoods and a drink would be just around the next bend. Soon enough, Fancy suggested we turn left onto a "jeep road", and not being entirely sure but knowing that Fancy has done the ride before, we followed her suggestion. You can tell that this is a jeep road because of the piles of rock either side of the apparent riverbed. Of course we weren’t lost. We knew more or less where were were. 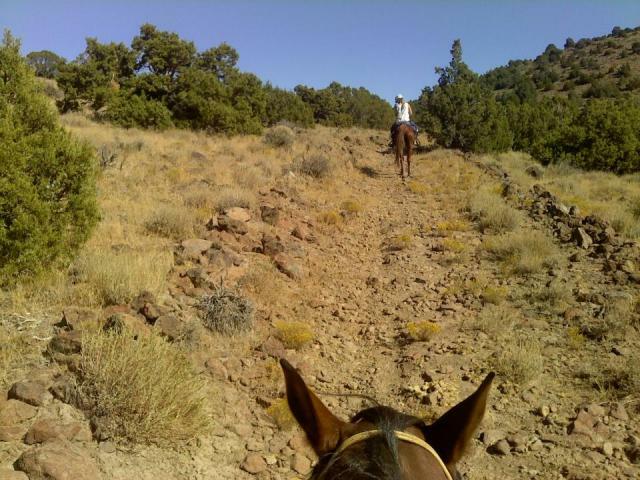 All we needed to do was go west until we hit the dirt road that drops into the Cottonwoods. After a mile or so of following the "jeep road" and its younger sibling, the "rocky track", we began to see small bands of wild mustangs all around us. How cool! The rocky track was starting to become annoying, so we opted to set forth across the plains for better footing. This proved to be a Bad Idea. What had appeared to be wide open flat grasslands was actually covered in volcanic rock that was impossible to walk on without scrambling and teetering at every step. Those mustangs are tough living out here, and we were both glad for the extra protection from our boots. The grassy plain stopped abruptly at a rocky cliff which we followed along the top of for a while, until – look, more mustangs! And look, that stallion seems to be paying extra special attention to us. Fancy obliged the stallion by selecting that moment to pee, filling the air with delicious mare aroma. Time to get moving. Back to the Rocky Track for a few more miles. Where are we? 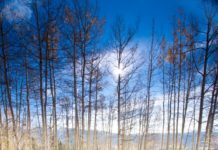 Cottonwoods can’t be far now? 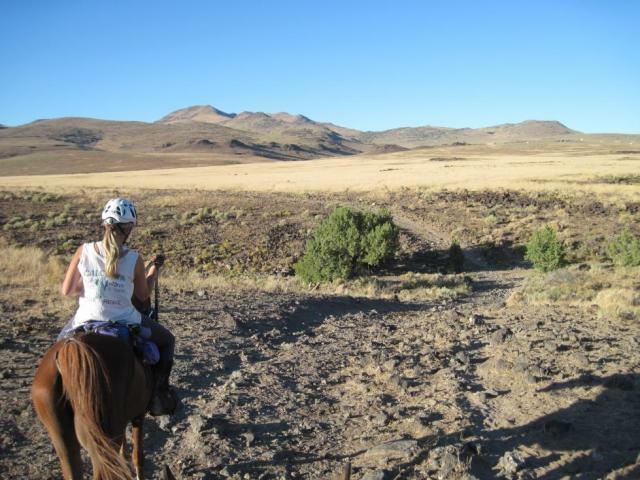 In the next 1.5 miles, we probably saw 40 wild horses in many small groups. Although some of the younger boys trotted towards us, once they realised that these strange new horses they were approaching had people on top, they rapidly lost interest. 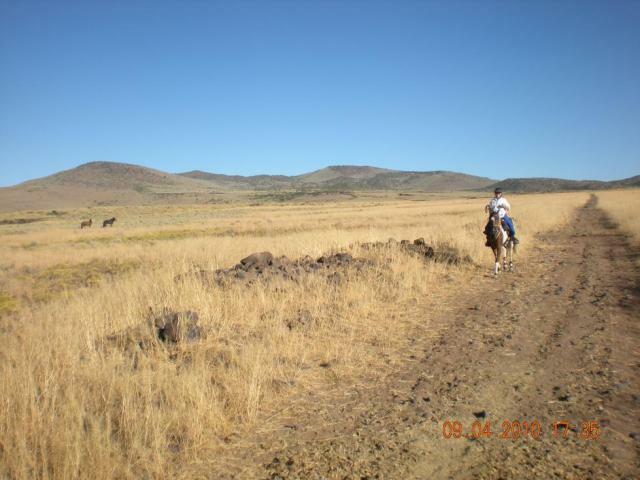 Most of the horses hardly looked up, just continued to graze on the sparse, dry vegetation. Finally we came to a spot that was recognisable on our GPSs. Although we were both carrying GPSs and although they both showed all the tracks we’d been on – even the Rocky Track – whenever we tried to zoom out to locate Cottonwoods, the scale would turn off the tracks and make it impossible to figure out where anything was. Couple that with bouncing over rocks, the glare from the sun, and riding a horse that refused to stand still, and the only way I could really use the GPS was to be standing completely still, off the horse, sunglasses removed, and threaten him with small death if he stepped anywhere within my 3 ft boundary. And then we figured it out. We were six miles too far north. Six?? how on earth did we manage that? At last we came to the powerlines which parallel the jeep road to Cottonwoods and followed it south for a short distance only to come across a mini Grand Canyon. The powerlines went across it, but we certainly weren’t going to. More backtracking until we made our way around that obstacle. Asking Tami what she felt was the hardest part about VC100, she replied "the never-ending rocks" – and we were definitely experiencing those to their full. Even fairly decent jeep roads like the one we were on were littered with loose rock, so that you could only trot 10 feet and then walk 30 until the next slightly clearer section. At about 20 miles, at the bottom of a steep canyon we came upon a creek which was a huge relief. It’s one thing to be "slightly misplaced" out in the desert, but quite another to be out there with thirsty horses. Both Uno and Fancy drank and drank and drank and from then on we knew everything would be fine. At the creek while off the horse, I noticed that Uno had lost the screw out of the back of one of his front Gloves and the gaiter had worked its way up over the back of his heel bulbs. This seems to be an occupational hazard this time of year – something to do with the dryness perhaps? Either way, we’ve lost about five of these screws in the last month. 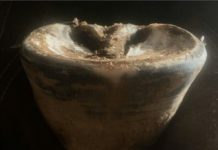 They are hard to tighten because the cross-heads tend to fill with concrete-like dirt. To remedy the problem, my husband came home the other day with a tube of LocTite. I resolved that I would spend some time this coming weekend LocTite-ing all of my Glove screws (four boots for three horses, plus their sparsies – that’s a lot of screws, but a lot less hassle in the long run than losing boots from screws falling out). I was able to push the gaiter back down to where it belonged and hoped it would stay there (it did). After crossing the creek we got very excited – here was the best footing of the entire day: a sandystone, somewhat eroded track. Yippeee! Of course, within about 15 seconds of starting to trot, Uno lost a back Glove slipping on a sideslope. Losing the boot wouldn’t have been a problem, but Uno decided that he was being attacked and had a small meltdown, kicking frantically at the monster clawed around his ankle* and completely trashing the gaiter. 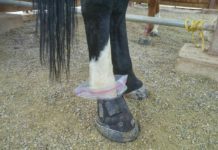 Curiously it was the boot with the PowerStrap (I had to take the other rear hoof PowerStrap off, since there was no way I was going to squeeze the boot over his fat but freshly-rasped foot with it in place). Even more curiously, it was a left boot. That’s just wrong, it’s always the right boot. This is messing with my theory that the right rear is the only leg that does anything. * there were some cows near the creek. They could have been Attack Cows. They had horns. The loss of the boot wasn’t a big deal. I always carry sparsies on the saddle just in case and after a quick interlude, we were off again. We continued to follow the powerlines and by now the sun was starting to set and we knew we were going to be out in there in the dark. No matter, that’s what we’re supposed to be practising, right? Around the next bend, we came across our most difficult obstacle – a stallion standing right next to the road. This one wasn’t doing the "timid wild animal" impersonation. This one wanted to play. He whinnied at us. Tami (on her mare) (me, glad I was on a gelding?) yelled at him – which didn’t remotely faze him and he fell in behind us with much enthusiasm. I tried turning Uno towards him – the way you’d face down a barking dog – but he wasn’t really worried about that either and continued to approach. Then we used our secret weapon: endurance horses that can trot without stopping for long periods of time… uphill… (boy was I glad Uno’s rear boots stayed on for that little escapade). After a few minutes of this, sure enough, the stallion decided we were too much work and stopped trotting behind us (mucho relief, given Uno’s fear of Things Behind). Down another long hill we got off and ran with the horses. We seemed to be making some headway. The footing was getting better and better (relatively speaking)… or it was getting darker and darker and we couldn’t see it? And we finally rejoined the "main road" that we’d been on earlier that morning. But hey, we were there to pre-ride the trail, right? And – much cheered by knowing exactly where we were – we were happy to be mimicking the trail-on-the-day perfectly. It was 9 pm and completely dark. We walk-trotted the rest of the dirt road back towards civilisation, admiring the multitude of stars. It’s actually surprising how much you can see when you’ve been out there in the dark so long and there’s some ambient light from Reno and Carson City over the mountains. Our night vision was doing great until we got alongside the usually-deserted Lousetown Road (yes, it’s really called that) and car after car after car kept coming towards us, blinding us with their headlights. Each time, we’d stop and turn away from the lights, then turn back and trot another ten feet before the next one came along. The almost omnipresent NV wind picked up in the last few miles and Uno got a little squirrelly (he can’t hear the monsters back there), but we made it back up onto the highway without incident (if you don’t count Fancy biting him on the bottom because he had the audacity to go in front for once). From the highway, we dropped down again, thankfully out of the wind, and hand-walked the horses down the steep, slithery hill, stumbling and falling down on the sudden side-slopes that we couldn’t see (all we could really see was the pale grey trail and "bush shapes" either side of it). So we ended up riding 35 miles instead of 20. No matter, it was a most excellent adventure.